This packet contains many pictures. It makes the prints harder to keep track of but a variety of visual aids are very important for this topic. Only a few pictures should be discussed at any length. Carousel horses have been the favorite and most often seen figure of American carousels since the 1880’s and this is still true today. However, horses are the most difficult to draw or sculpt to many kid’s satisfaction, so a variety of animals helps projects feel less intimidating. Many examples of a variety of animals will better inspire projects for this packet. BE EXTRA CAREFUL TO RETURN ALL PRINTS TO THE PACKET AFTER YOU ARE FINISHED! Afford future classes and other schools the same opportunity that you had with this excellent variety of visual sculptural examples. The Giraffe book (included) is for PATTERN discussion. This is a sculpture packet so FORM is the important element to cover. Compare FORM/SHAPE. Two-dimensional SHAPE projects are fine (there are several suggestions) but everyone is capable of sculpting with clay for this packet if your Art Discovery has the budget for it. Straws, barbeque skewers, or chopsticks can help sculptures stand inexpensively when mounted in a small clump of clay. COLOR and VARIETY are also important. 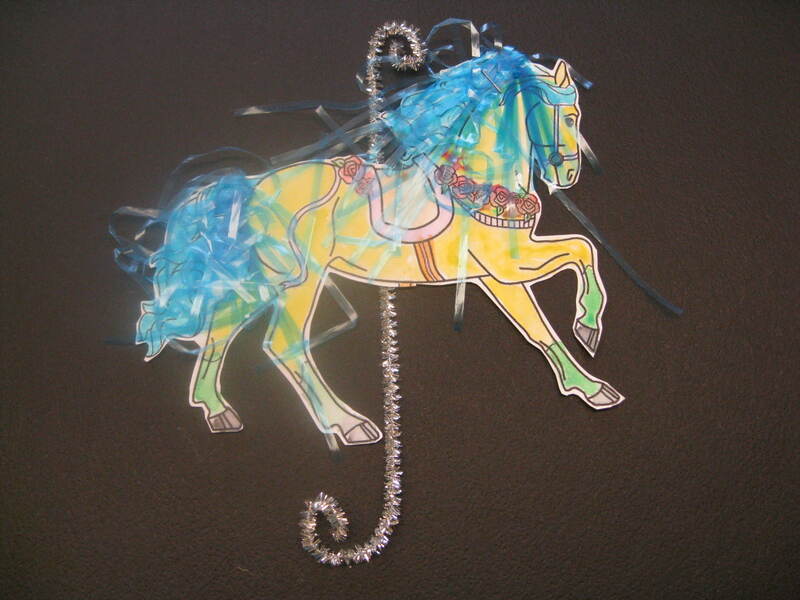 Carousels enticed customers with a variety of bright colors and many elegantly detailed decorations (trappings). Both 2-D and 3-D projects will probably use glitter, sequins or jewels this month. Make sure ALL 13 pictures are returned to the packet Carrier after your Presentation is finished! Abreast: The number of concentric rows of animals on a carousel, for example, a three abreast carousel has three animals side by side, a two abreast carousel has two. Armored: Trappings that resemble medieval armor, the protective coverings worn by both rider and horse in battle or pageantry. Cantle: the raised portion at the back of a saddle. Many carousel carvers turned the cantle itself into a sculpted bird or animal. Another popular treatment for a carousel cantle was to carve a person’s or an animal’s head behind it. C.W. Parker was the carousel maker known for putting carved ears of corn behind the cantle, a trademark and symbol for mid-west America, being his company was located in Abilene, and later Leavenworth, Kansas, the farthest western location of any major Carousel company. Carousel: A revolving machine carrying animals and sometimes chariots, designed to be ridden for amusement. The figures were originally of wood but are now also found in fiberglass or metal. Carousel Panel: Made of wood or of canvas with a wooden frame, these were made to conceal the mechanisms at the center of the carousel. Panels were sometimes painted with tranquil scenery or exciting jungle landscapes. The C. W. Parker carousel, at Jantzen Beach, had the panels refurbished in the 1990’s. Scenes showing familiar landscapes of Oregon were painted over the original panel decorations. Chariot: On a carousel, a stationary structure, fitted with benches and frequently with wheels, resembling in style the ancient Roman transport or baroque coaches. The sides were elaborately carved and painted usually with mythological figures or patriotic themes. Cropped mane: A mane that has been clipped short, usually two to three inches long; also called a “roached” mane. Armored horses often have this type of mane as an added precaution for battle. Factory paint: Paint that has been reapplied by a carousel company, which was not necessarily the original carver of the figure. Flying Jenny: An early form of the carousel, where the wooden animals hung freely by poles or chains attached only to the overhead structure. Inside Row: The row of animals closest to the center pole. Jewels: Glass inserts, usually faceted and of various shapes and colors, which simulate precious stones. Popular additions to carousel horses, these were especially fashionable with carousels on Coney Island, in New York, which hosted many carousels in the late 19th and early 20th centuries. Jumper: Carousel animal which is designed to have all four feet off of the carousel platform and which moves up and down as the machine turns. In about 1880, an Englishman named Frederick Savage invented the jumping mechanism, which proved a big boon for the carousel business. 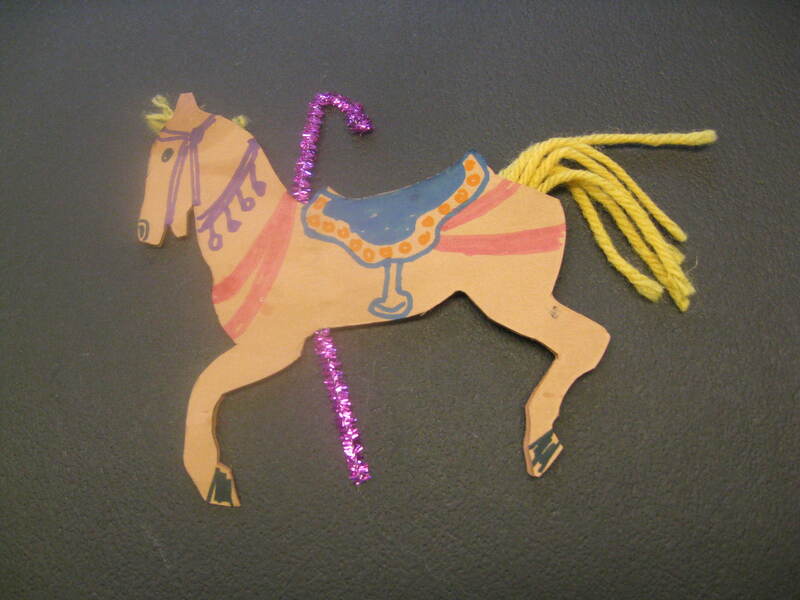 Lead Horse or Lead Figure: A Lead Horse was always the fanciest horse that led a Circus parade. The fanciest horse on a carousel, and often the largest, was always found on the outside row and sometimes inscribed with the maker’s signature or initials. Armored horses were always popular as a Lead horse. If a rare lion was included in a carousel menagerie, it was always the Lead figure. The carousel manufacturer usually designated the Lead horse or figure, the one leading all the rotating Carousel figures, but owners sometimes changed this designation. Menagerie Figure: Any carousel animal other than a horse. Merry-go-round: This term is found in use as early as 1729 in England. Although most of the manufacturers of these machines referred to them as carousels, merry-go-round has always been the name most popular. Outside Row: The outermost row of animals. These were also typically the largest and most detailed figures on the platform, designed to call attention to the carousel and attract paying customers. 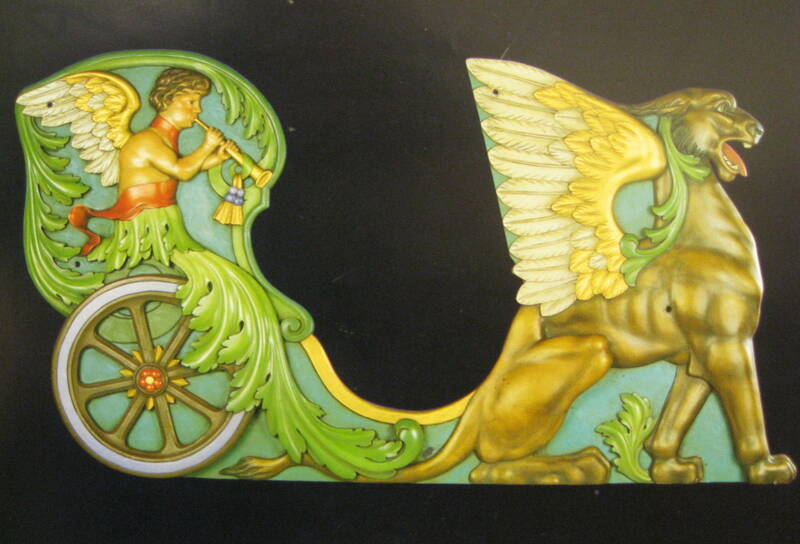 Original Paint: The paint that carousel figures or carousel trim has when it originally leaves the manufacturer. Park Paint: Paint that has been applied to the carousel animals and chariots by those operating the carousel as part of maintenance. Some restored wooden carousel figures had so many layers of this type of paint over the years that many delicately carved details were hidden. Platform: The floor of the carousel, which is suspended from the sweeps by means of steel rods. Romance Side: The side of the carousel animal that faces toward the spectators. This side of the animal is usually carved more elaborately than the inside, facing the center pole. On American carousels, the romance side is on the right. For English machines, which rotate in the opposite direction of American carousels, the romance side is on the left. Roundabout: British term for the Carousel or Merry-go-round. English carousels move in a clockwise direction as opposed to American carousels, which run counterclockwise. Rounding Boards: The decorative boards covered by either plaster or carved wood, painted with a variety of scenes, and attached to the outer perimeter of the sweeps. Along with the shields, rounding boards form a decorative cornice around the outside top border of the carousel. Rounding boards are also often decorated with decorative lighting. Shield: Oval, round or shaped like a medieval coat of arms, carousel shields are wood or plaster, and are sometimes set with mirrors. The shields hide the joints between the rounding boards; together they form a decorative cornice around the outside border of the carousel. High Relief Jester or clown faces are also found on shields. The Jantzen Beach C. W. Parker carousel has cherubs decorating it’s shields. Side Figure: A major decorative human or humanlike figure carved on or near the front shoulder of the romance side of an animal. Especially associated with Dentzel’s master carver, Salvatore Cernigliaro, these figures vary greatly in pose and garb but usually typify a popular theme. Stander: A carousel horse that is attached to the platform and stands on at least three feet. This animal is not attached to a pole, but stands on its own. All of Gustav Dentzel’s early carousels were completely created with standers. After Jumping mechanisms were invented, Dentzel still put standers on the outside row. Sweep: A long plank, usually three inches by five inches, radiating out from the center pole. Connected by cables to the top of the center pole, sweeps suspend the carousel platform by means of steel rods. Trappings: The equipment and coverings of a carousel animal. These could include the saddle, saddle blanket, bridle, reigns, coiled rope, pistol, rifle, American flag, flowers, ribbons, and sometimes armor. Military trappings featured realistic military equipment. Daniel Muller is best known for carving these detailed renderings of saddles, bedrolls, canteens, swords, etc., that were precise replicas of Civil War U.S. army issue. Muller’s carved military saddle details were so complete that he even carved the saddle stitching. Early carousel carvers followed basic patterns to make the figures (animals) that were commissioned for each merry-go-round. American carvers used basswood, from the American Linden tree. This type of wood has been used for many years to create wooden rulers, because it did not warp or shrink as most other types of wood, so the rulers remained straight. Basswood was also the reason that American carousel figures were far superior in quality to European carved figures. European carvers did not use basswood because Linden trees grew only in America. They used many different types of wood and all were more prone to damaging warping and cracking with age. Carousel figures were initially carved in separate segments, and then glued together for the final touches. Employees in a carousel factory each worked on different sections of the carousel animal’s production, which required different levels of skill. First, small blocks of wood were glued together for each carved segment. Young carving apprentices (boys 8-12) learned early how to prepare the glue, which was made by boiling animal skins. More experienced apprentices joined blocks into solid chunks, the smallest for carving legs, the largest for heads. The basic pattern for the animal’s body was a hollow box. Sometimes bodies contained up to 70 blocks of wood. It was necessary for the body to be hollow, to reduce the figure’s overall weight. The legs were the easiest part of the animal to carve. After apprentices learned the gluing process well, they began to carve sections of legs. These were sculpted separately, and then attached to the body with wooden pegs and glue. Nails were never used. Unfortunately, many carousel owners over the years repaired legs using nails, which eventually caused harmful damage to the wood. All of the paint has been removed from these two horses. It gives us a chance to examine how carousel animals were glued together before carving. It also allows a more complete and detailed view of the carver’s art. Both animals are FULL ROUND SCULPTURE, carved on every side, all the way around. The unpainted wood seems in good condition but it is possible that these horses once had sections needing replacement carving. To restore a damaged or rotted area of carousel carvings, sections of the problem blocks are removed and new wood glued in their place. These replacement blocks are then carved to match the original carvings surrounding them. The horses here look ready for the first coat of primer. Several coats of primer are required, with careful sanding between, before the final paint and varnish can be applied. For those people who wanted the experience of riding a carousel but were hesitant about climbing onto an animal, there were chariots, or benches. Carousels usually carried two chariots, fitted with two five-foot benches, accommodating three people each. One of the problems in designing the chariot side was developing a theme that could fit with the shape of the preset pattern of the chariot side panel. The inside row chariot panel, facing the center pole, was always the same outside shape but the design was usually only painted, instead of also having raised relief carving. This single chariot panel shows two ferociously carved creatures guarding the entrance to the chariot, holding a drape across for riders to step over. Ladies wearing dresses in the 1890’s would probably not have felt “proper” astride a saddle and many would have preferred the chariot seat. Originally, carousels all had only large animals. Smaller children might want to sit in a chariot. 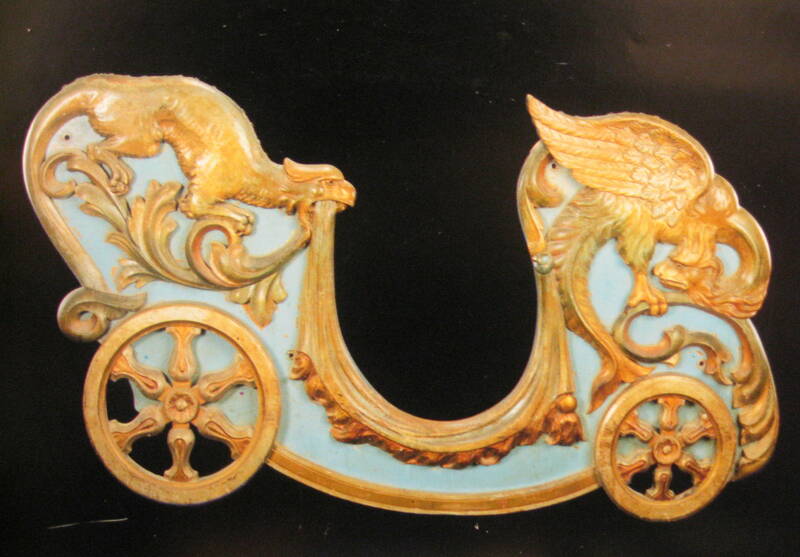 Besides conforming to the shape of the chariot panel, the only other guideline was that scenes carved on the chariot stay within “proper” Victorian moral boundaries. Angels, eagles, and a variety of winged monsters were favorite chariot themes. Steel rods were bolted through holes drilled in the carvings in order to support the seats and backs while keeping the two side panels together. Which classic type of sculpture was used on the outside panels of carousel chariots—sunken relief, low relief, high relief, or full round? A relief sculpture is attached to a background; it is not carved all the way around. 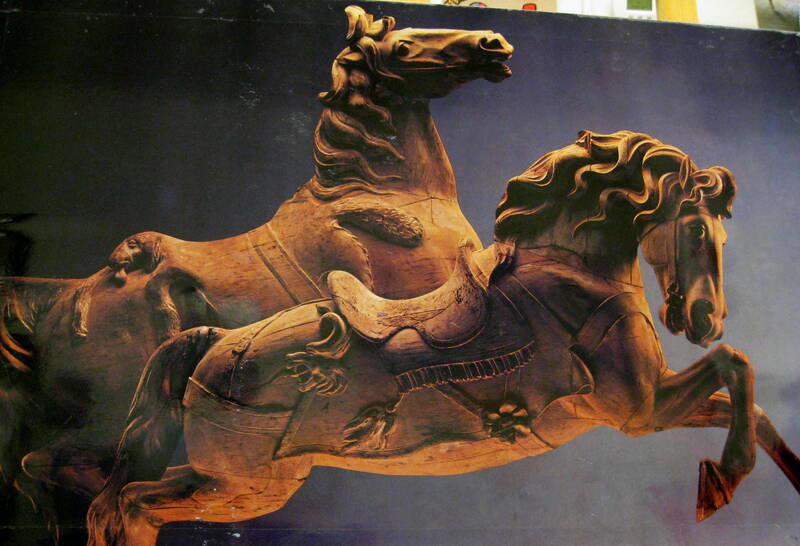 Bas relief (pronounced bah), also called low relief, was used on each chariot panel example. Another tangible example of this type of sculpture is a coin. Although these sculptures stand out much farther than a coin, they are also much larger. The sculptures do not proportionately project as far as a high relief sculpture, such as Mount Rushmore. A sunken relief sculpture is carved into a flat surface. Full round is a statue that you can walk all the way around and see sculpture. If you have the chance to visit the Jantzen Beach Carousel, before I return next month, could check to see if this chariot is carved on the inside panel or not and let me know what you discover. If you have the chance to see this carousel with your family, maybe you can also teach them some of the things we learned today about carousel art. 3. “Dentzel Golden Brown Bear” Shop of Gustav Dentzel Circa 1904. 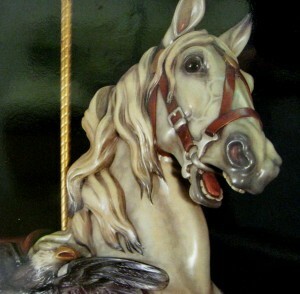 The most often seen figures on a carousel have always been horses. 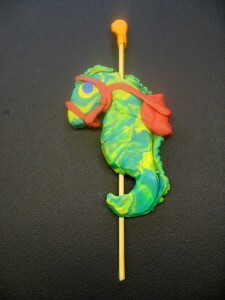 But since kids love many other types of animals too, carousel carvers also created a variety of other types of animals. Carousels with animals other than just horses are called Menageries. Gustav Dentzel introduced the first menagerie animal to America. This was a lion carved by his father, Michael Dentzel, brought over on a ship with him from Germany. Carvers used their imaginations to create an assortment of familiar household pets, farmyard animals, ferocious wild beasts, desert or jungle creatures, and strange mythological creatures for menageries. Yet, despite the appealing flamboyance of these menagerie figures, they were never as popular as the horse. All menagerie figures are somewhat rare today since horses were the most well-liked. Only a few American companies produced these exotic creatures. Dentzel, Looff, Illions, and Muller carved the very finest examples of menagerie figures. Dentzel menagerie animals included cats, dogs, roosters, goats, mules, pigs, rabbits, bears, deer, tigers, zebras, giraffes, lions, kangaroos, and ostriches. Kangaroos were very rare. Only two companies carved them, Dentzel and Herschell/Spillman. 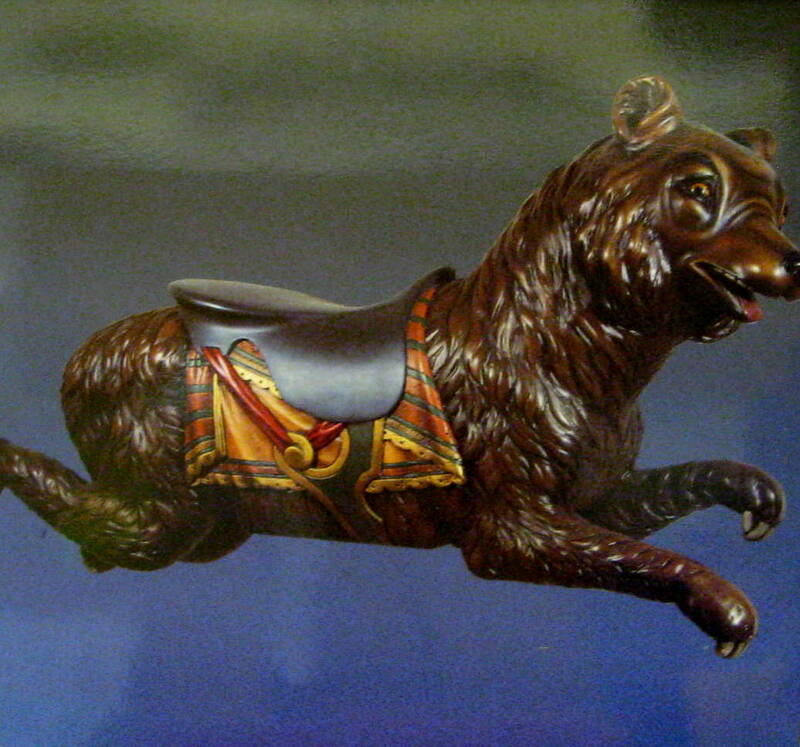 The Dentzel Company was the only major American carousel manufacturer to produce bears. Cherni was the one who established many of Dentzel’s most popular menagerie figures, including cats, pigs, rabbits and ostriches. The bear seen here was another of Cherni’s designs, yet it never gained the popularity that many of his other menagerie animals did. Cherni worked at the Dentzel factory until it closed, in 1928. During World War I, when carousel production was limited, he did precision carving on hundreds of airplane propellers. After the Dentzel factory closed, Cherni moved to California and taught art and woodcarving to others. This bear was carved when Gustav Dentzel ran the company. The other bear was carved about 9 years later, after Dentzel’s son, William (“Hobby Horse Bill”), assumed control of the company. Compare the poses of the two Dentzel Bears, how are they alike/different? How are their trappings alike/different? Which bear do you like the best? Why? Would you choose one of these bears to ride or would you prefer a horse, like so many other people preferred? Does the bear seem scary or dangerous? Don’t those long claws make you nervous? Are the bear’s faces just alike? No, this one has a closed mouth and the other bear has a slightly opened mouth. How do you think these bears feel? What type of look do the bears have on their faces? These bears were often referred to as having happy faces. 4. “Dentzel Dark Brown Bear.” Shop of William Dentzel. 38” long, 38” high. Circa 1915. William, as the eldest son of Gustav Dentzel, was the first in line to take over the family business. He learned to carve in the family factory but once he assumed control of the company, after his father’s death, William laid down his chisel for good. He had worked in the carving shop for many years and was familiar with every phase of carousel production. His brother, Edward Paul, continued the family caving tradition and, together Gustav Dentzel’s sons, carried on their father’s commitment to quality. No other family member wanted to run, or was capable of running, the business now. The great family establishment originated by Gustav Dentzel ended under the auctioneer’s gavel on January 18, 1929. Shortly after the death of “Hobby-Horse Bill”, the Great Depression arrived and the Golden Age of the Carousel ended too. Because people did not have much money during the Depression, the nickel it cost to ride a merry-go-round was an unnecessary extravagance and most carousel manufacturers went out of business in the 1930’s. 5. “Dentzel Rabbit” carved by Salvatore Cernigliaro (Cherni). 60” high, 50” long (c. 1908). 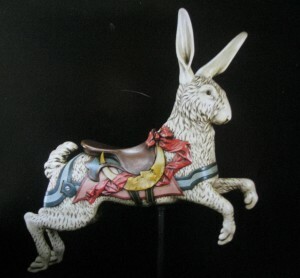 Several types of Dentzel’s menagerie animals, including rabbits, were always carved as jumpers. Since Dentzel carousels had only standers on the outside row, this meant that rabbits, because they were jumpers, were always placed on the inner rows. Inner row animals were not as easy to see from the outside of the carousel. While the outer row animals always had a large amount of decorative trappings on their “romance side,” the side which faced potential customers, the inner row animals always had less. Because of this, few of the rabbits were carved with anything more than the “standard” saddle and saddle blanket trappings. This rabbit is an unusual exception to the rule. Although Cherni was the inventor and designer of many of the menagerie creations carved by the Dentzel Company, other carvers in the shop made them. Cherni carved this particular Dentzel rabbit himself. Besides the usual inside row trappings, this rabbit also has a carved flowing ribbon and a crescent moon on its romance side. Inner row animals usually had more balanced decorations that were the same on each side. Why do you think this animal was never carved as a “Stander” type figure? 6. “Dentzel Horse Facial Detail.” Shop of William Dentzel (c. 1920). Of the approximately 3,000 to 9,000 complete classic wooden carousels originally carved in American factories (available records are lacking for an exact count), fewer than 200 are still in use today. The “Golden Age” of the American Carousel lasted for only 50 years, from 1880 – 1930. Painstakingly carved and carefully hand sculpted, carousel art has been a long neglected and misunderstood American art form that many still know nothing, or very little, about. A Craftsman must have dedication and training in order to create quality work. The most talented craftsmen were apprenticed at a young age to learn their trade. Sons generally learned as boys from their fathers, in order to carry on the family business. The demanding road of a skilled carver led from apprentice, to journeyman, to Master Carver. The journey was often long, filled with frustration, and sometimes with injuries. Yet, once the skills were finally learned, he was qualified for a successful lifetime of employment. Master Carousel Carvers came from the ranks of a few hundred (mostly immigrant European) carvers who had previously produced much high quality work designing furniture improvements, wooden sailing vessels, architectural decorations, or religious artifacts. All quality carousel carvings were more than roughly made assembly line products; their creation took an investment of time and skill. The polished ability of any Master Carver could produce a high quality, realistic and very useful amusement ride decoration. Yet, some of these crafty creations were more than useful and attractive; they had an extra “something” that all the others didn’t. The carver, who used his abilities to create a unique sculpture, communicating personality and feeling, set himself apart from the others and was not just a skilled craftsman, but a true artist. The head was the most difficult area of the carousel animal to carve and only a Master Carver, also known by the less formal title “Head Man,” worked on this section. Few skilled Master Carvers were driven to create with the level of imagination that a true “artist” possesses. It was in the carving of an animal’s face that genuine artists emerged. Only an inventive and inspired artist could create individuality and sensitivity in one of these faces. Capturing emotion is the ultimate expression of art. Unfortunately, carousel carving has been mostly ignored in the category of “Fine Art,” and these sculptors have never been given their proper recognition. Today, it is generally agreed that Charles Looff and Daniel Muller (who trained in Gustav Dentzel’s shop) carved the most magnificent examples of Fine Art ever produced during the “Golden Age” of the American Carousel (1880-1930). The early shops of Gustav Dentzel and Charles Looff each strove for high quality and realism in their carvings. Very likely it was because of this demand for exceptional quality that several fine artists emerged from these companies. Charles Carmel, M.C. Illions, Stein, and Goldstein were artists who surfaced from the Looff shop. “Cherni” was another skilled artist from Dentzel’s shop. Unfortunately, some of these artists remain anonymous, their work known only by the Company they worked for. We can only touch on a handful of these talented sculptors in one Art Discovery packet. That many works of Fine Art Sculpture were produced in American Carousel Factories from 1880 – 1930 has been a long unrecognized fact because many never knew that these original and attractive carnival seats had all actually been hand carved. This particular carving was produced in William Dentzel’s shop. It is an aristocratic outside row “stander”, typically known as the “thoroughbred”. The horse has a combination of several distinctive traits of typical Dentzel carvings, introduced by more than one of Dentzel’s artists. This horse is not attributed to a particular artist and is only identified by the manufacturing company that it came from. The figure has been refurbished and is now in a private collection. Which carving is a FULL ROUND SCULPTURE and which is a RELIEF SCULPTURE? The horse is a FULL ROUND SCULPTURE, the eagle is connected to a background (the horse) so it is a RELIEF SCULPTURE. “Detail” means a close up view of only a portion of an artwork. This “detail” gives us a chance to look closely at the most typically expressive area of a carousel animal—its face. This was also the hardest part of the animal to carve. A Carver able to carve an animal’s face with feeling and personality is more than just a “Master Carver”; he is a true “artist”. Was the carver who created this animal a skilled Master Carver or did he cross over to the category of a true Artist (Sculptor)? The eyes and expression of this horse communicate unique feeling, personality and expression, signs of a true artist. Does this horse look real? Two brothers, Daniel and Alfred Muller had close ties to the Dentzel family. Their father, Johann (yoh hawn) Muller, was a personal friend to Gustav Dentzel from when the two of them lived in Germany. In 1881, Johann moved his family from Hamburg Germany, to Brooklyn, New York. As a cabinetmaker and carver by trade, he soon found work in New York as a carousel carver for the Charles Loof Company. Daniel was the older of Johann’s two sons, and at the age of 10, he and his younger brother began to learn their father’s craft after school. It was a tradition in those days for sons to learn the trade of their father, to continue the family business. Varying from this tradition was considered disrespectful. The Muller boys followed this long observed practice. As apprentices, the boys first did only the small jobs in the shop, like sweeping, sharpening tools, and mixing batches of glue. Eventually the boys learned to glue blocks of wood together that were used to carve the carousel animals. Slowly they were given smaller carving jobs, beginning with sections of the legs, which grew as their confidence and abilities grew. After a few years in America, the Mullers moved to Philadelphia. Johann went to work for his old friend Gustav Dentzel. Daniel and his brother continued their woodcarving training in the Dentzel shop after school. Unfortunately, Johann passed away a few years later. His sons were still teenagers. Just months after her husband’s death, Johann’s wife also died. As a favor to his friend, Gustav took the boys in and treated them like family. The boys were able to earn their own money by continuing to work in the Dentzel factory. Daniel learned his craft very well but his interest in art went beyond simply carving. He carried a sketchbook with him wherever he went. He loved drawing people that he saw on the street, animals at the zoo, and detailed imaginative creatures. Keeping a sketchbook handy was something that he continued to do all of his life. Daniel wanted to know more about art than what he could learn in the carving shop. He signed up for classes at a public art school and finally enrolled at the prestigious Pennsylvania Academy of Fine Arts, a few years later. Eventually, because of Dentzel’s strict and tight control, the Muller brothers left the Dentzel factory and began carving for other companies. Gustav saw this as a betrayal and he never forgave Daniel and Alfred for being disloyal to him. Around 1904, Daniel and Alfred opened their own shop. They owned and operated some of their own machines and also carved animals for a variety of other clients. For more than 10 years the D.C. Muller & Brother Carousel Company produced the most realistic and intricate carousel figures ever made in America. Unfortunately, they could not keep carving and still compete with the larger companies of the day. The brothers closed their business in 1917. William Dentzel took over the Dentzel Company after his father died, in 1909. He did not carry his father’s grudge against the Mullers and rehired them both in 1918. Daniel brought many exciting new designs with him on returning to the Dentzel factory, where he stayed until it closed, in 1928. After the carousel industry folded, it may have been that Daniel was too discouraged by the failure of his own business to pursue a career in Fine Art sculpture. Although there were occasional sculpture commissions up until his death, in 1952, Daniel’s drive to create seemed to have left him. Today, Daniel Carl Muller, the talented Fine Art sculptor, is considered one of the two premier American carousel carvers who ever lived. 7. “Muller Circus Horse Stander” carved by Daniel Muller (mew ler). Shop of D.C. Muller & Brother. 59” long, 63” high (c. 1910). Daniel Muller was born in Germany, in 1872 and died in America in 1952. Muller paid extraordinary attention to detail with his carvings. He is considered to have taken carousel carving to its highest level of perfection and created some of the finest examples of the carver’s art. At the time of Daniel’s formal sculpture training, equestrian (horse) sculptures honoring Civil War heroes were very popular. Many American sculptors were making a good living creating memorial statues for American towns and cities. Art schools everywhere were placing a strong emphasis on the instruction of equestrian statues. This was exceptionally fortunate for a carousel carver whose most requested figure was the horse. Probably because of his artistic training, Daniel Muller specialized in authentic military trappings. Many of Muller’s carousel horses displayed the genuine saddle style of famous Civil War General McClelland. This saddle has its own unique shape. The saddles were decorated with extremely realistic and very detailed military equipment. Sometimes the carving was so historically accurate the artist even carved the details of the stirrup stitching and the grip on the sword. He would carve small, regularly spaced stitching holes around the edge of his saddles and insert heavy thread to give the illusion that real leather had been used. The saddles and bridles of his horses were sometimes carved to resemble real tooled leather. Daniel Muller’s horses show much restrained elegance in their faces and postures. They are spirited, never too wild, but always very intense. The sensitive, expressive eyes that Muller carved on his figures are not the usual type found in the work of other carvers. His horses each had their own unique personalities. It was mostly his extraordinary abilities with facial expression that made him such a fine master carver. This horse was an inside row figure. By the time this horse was carved, Muller had developed his own distinctive style. The face of the horse is extremely expressive. The neck, chest, and thighs are quite muscular, giving the horse a look of power. The trappings are fashioned after the style of circus horses (point out the plume on his head and the tassels at his side), but the saddle is modeled after the 1859 McClelland military saddle. This horse also has authentic metal horseshoes and a real horsetail. Compare the style and shape of this saddle to the saddle of the other horses. How are they similar? What makes each different? Born on May 2, 1852, in Schleswig-Holstein, once located between Germany and Denmark, Charles I.D. Looff came to New York in the summer of 1870. He worked as a woodcarver in a furniture factory. During his spare time at home, usually early dawn, he carved wooden animals from scraps that he gathered at the furniture factory where he worked. Charles Looff joined the carousel industry with his first menagerie carousel machine in 1876. He painted and assembled the animals on a frame and platform that he erected at Coney Island. This merry-go-round was an instant success that encouraged Looff to make more. Coney Island, a world-famous seaside resort, in Brooklyn, New York, has been the home of many famous classic carousels. The most historic carousel, placed at Balmer’s Pavilion on West Sixth Street and Surf Avenue in 1876, was this original one, made by Charles Looff. Looff opened a shop in Brooklyn and soon turned out his second carousel, much more refined than the first, and installed it at Coney Island. Looff’s creations, like Dentzel’s, were reminiscent of the German style of carving. Dentzel’s and Looff’s companies paralleled each other in design, production, and quality in the early years. Looff did much of the carving himself and his beautiful and detailed horse sculptures are highly prized by collectors today. Along with Daniel Muller, Looff is considered one of the two premier American carvers of Carousel figures. By 1895, Looff was building huge carousels. Looff aspired to a more fanciful design, both in his carousels and the buildings that housed his carousels. 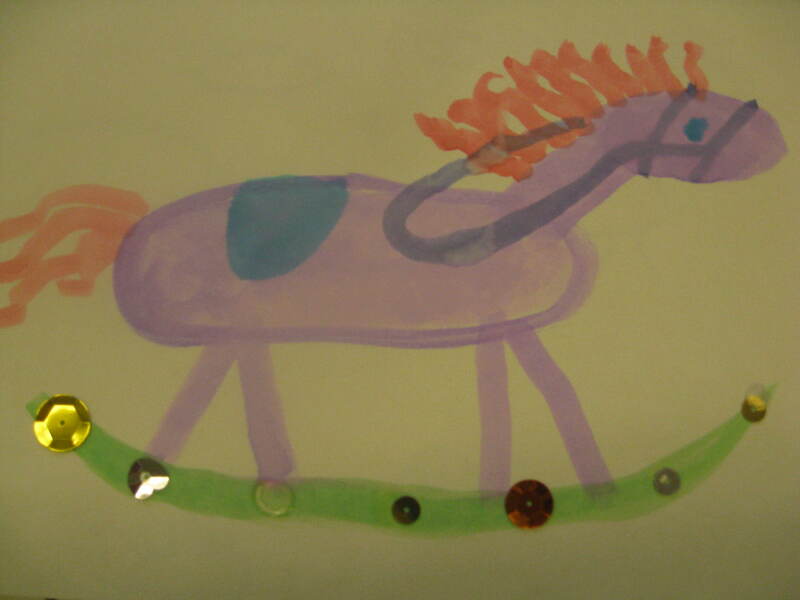 Glass jewels and beveled mirrors were added to trappings; leg positions and manes were more animated. The animals’ appearance was further enhanced by the addition of electric lights to the carousel structure and by the use of colored glass in the windows of the building. The overall richness of this effect became one of Looff’s trademarks. As business increased for Looff in the 1890’s, his staff of carpenters, carvers and painters also increased. Among the forty talented craftsmen were four young carvers who were to later form their own carousel companies—Carmel, Illions, Stein, and Goldstein. These names are known today on a short list of some of the finest and most imaginative carvers in the business. In1905, the City of New York condemned the property that the Looff factory sat on, in order to create a park. Looff moved his factory and his family to Riverside, Rhode Island. In August of 1910, Looff moved his factory to Ocean Park, California. Shortly after this, he moved to a permanent location at Long Beach, California. Looff built an apartment for himself and his family on the second story of his carousel building, where he and his stayed until his death, in the summer of 1918. 8. “Looff Sneaky Tiger” by Charles Looff (lewf) (c. 1905). This sneaky tiger is one of the rarest of all carousel carvings. It is one of only three of this style carved by Charles Looff ever known to exist. This sneaky tiger was last on board a carousel in a park in Seattle, Washington. It is now in the personal collection of a carousel collector. 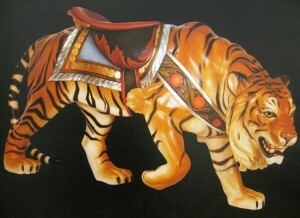 There is another very rare Looff Sneaky Tiger located on a working carousel now located at Riverfront Park, in Spokane, Washington. Have any of you ever seen or ridden on this carousel? What kind of feeling does this tiger give you? Describe the personality this animal seems to have. Why do you think he is called “sneaky”? What type of PATTERN does the tiger have? What type of LINE can you see painted on the sculpture? 9. “Looff Medieval Armored Horse” by Charles Looff (lewf) (c. 1911). Looff created armored horses in a simpler but more elegant style than the other carousel makers. Companies such as Carmel, Spillman, and Stein and Goldstein carved their horses with very heavy looking armor. Looff’s armored horses used more elegant drapery and medieval coats of arms to decorate the body, instead of so much heavy metal. This horse was designed to be a jumper. The legs of Looff’s jumping horses were always slender and graceful and they were always portrayed with a great deal of motion. What did the artist do here to create the feeling of MOTION? The horse’s head is covered in protective armor so we can’t see the mane, which is the most common way for carousel carvers to create the impression of motion. Yet, this horse seems to be full of movement with its curved front legs and zig zag back legs. Curving forms and lines help create the appearance of MOTION. Does everybody understand what a “coat of arms” is? Who would like to explain this for me? Where can you see the coat of arms on this horse? Compare this armored horse to the Parker one. How are they alike and how are they different? 10. “Looff Giraffes” by Charles Looff (lewf), from the Collection of Duane and Carol Perron. These Looff giraffes have been painted with a very minimum of trappings. They are painted with a dark brown PATTERN of spots. The companies that carved giraffes each did something uniquely different with them. Most giraffes were painted with light brown or reddish brown spots. Show photos from the Giraffe book (included) for comparison with some of the different colors and patterns of giraffe spots. (Please return this book to the packet when you are finished so that others will also have the opportunity to use it!). This book is a good tool for discussion with K-1. The giraffe’s long neck sometimes inspired carved, slithering snakes coiled and curved around it. Carved monkeys were also popular giraffe decorations. Gustav Dentzel loved giraffes and included at least one row of them on most of his carousels. 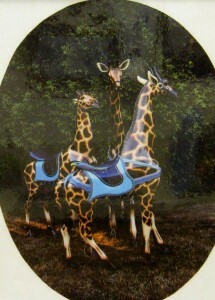 Even after the galloping motion was developed, he continued to place stationary giraffes (standers, like the Looff giraffes pictured here) on his machines. The giraffe went through several changes at the Dentzel Company. The earliest 1890’s Dentzel giraffe style had a raised head and blank expression. Later figures (c.1900 -1902) eventually had a curved neck, dropped head, and a more alert expression. The trappings of the giraffes, as with most menagerie figures, were usually simple. Cernigliaro, who worked for Dentzel, carved more elaborately decorated giraffes. Draw a large giraffe or a zebra. Draw and then paint PATTERN on them. 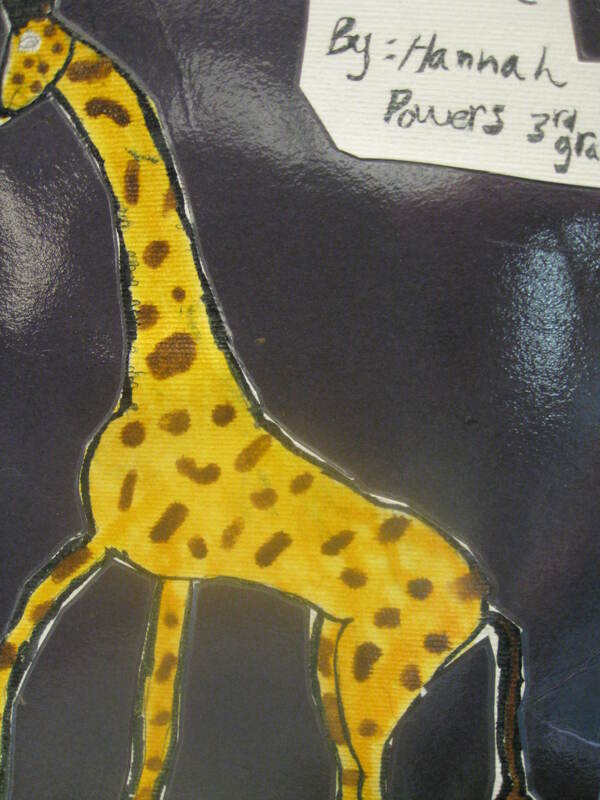 Cut out and mount on contrasting black background for the giraffe, or a red background for the zebra. Did you know that every zebra and giraffe has its very own individual PATTERN markings, the same way that humans each have their own fingerprints? Charles Wallace Parker was born in Griggsville, Illinois in 1864. His family moved to Abilene, Kansas when Parker was just 5 years old. He grew up in the wild town of Abilene, Kansas, the heart of the American Wild West. At the age of 17, Parker became interested in the amusement business, and bought a high striker device to test the strength of the cowboys visiting Abilene. Later he bought a shooting gallery from Schmeizer Arms Company of Leavenworth, Kansas. In 1892 Parker bought a used Armitage-Herschell track machine and operated it until 1894, when he built his own track machine (almost a direct copy of the Armitage-Herschell) and started the C.W. Parker factory in Abilene. By 1900, Parker had traveling carnivals in the Midwest and his business was rapidly growing. He built all types of amusement devices, including the railroad cars that transported these machines. 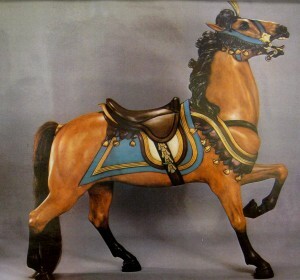 Parker was not an artist and did not carve his own carousel figures, but hired carvers who developed a particular and very simple Parker Style of horse. His Company only carved horses and Parker eagerly began using the later electronic “carving machine”, which shortened several steps of the carving process and created horses more similar in appearance. All but four of his carousels were designed in a Country Fair Style. This style of carousel was for traveling carnivals and small country fairs. His horses were small and compact and designed to stack easily for transportation. The carvings were quality works but definitely not work of extreme realism or magnificent art. Parker’s carousels began to evolve through several style changes. He went from the track machines to the jumping carousels, from steam to electric. The carving on the horses began to get more fanciful and make believe as Parker’s business continued to grow. By 1905, Parker had four full sized carnivals on tour throughout the country. He also sold equipment to other amusement operators. The Parker factories in Abilene were a series of relatively small buildings, which became increasingly crowded, so he built more. Eventually some of the buildings began blocking areas that the city planners had surveyed to be streets. A rift began to grow between the Parker operations and the Abilene town leaders. Parker made the decision to move to new quarters in Leavenworth, Kansas. The Parker Company began moving to its new factory in Leavenworth, in 1911. The new headquarters was a much larger two-story brick building located south of the city center. The factory had 10 railroad sidings to hold all of the Parker carnival equipment and all of the shipments of amusement devices he sent all over the world. The Parker “Carry-Us-All” (his play on words for carousel) continued to be the most important part of his amusement business. The company built hundreds of small traveling carousels that were used by carnivals worldwide. He also built four large, extravagant Park Style machines, designed for permanent installation in large amusement parks. Just one of those permanent carousels still in exists—in Portland’s Jantzen Beach Mall. Parker operations grew every year as he produced new products, and attractions. Parker tried to keep all of his shows “family oriented”, with patriotism, motherhood, and apple pie as key words in his operations. In general, he had a good reputation, but he was foremost a businessman dedicated to improving his position in the amusement industry. He pushed the popular values of America at the time because the carnival business in general was becoming known as a business of shady characters with improper ethics. Although his major incentive was a promotion toward his business, Parker seemed sincere in his efforts. In about 1914, C.W. Parker began introducing a new stretched leg and long bodied shape to the horses on his carousels, which became his best known figures. By 1917, Parker’s company had phased out most of the older designs. 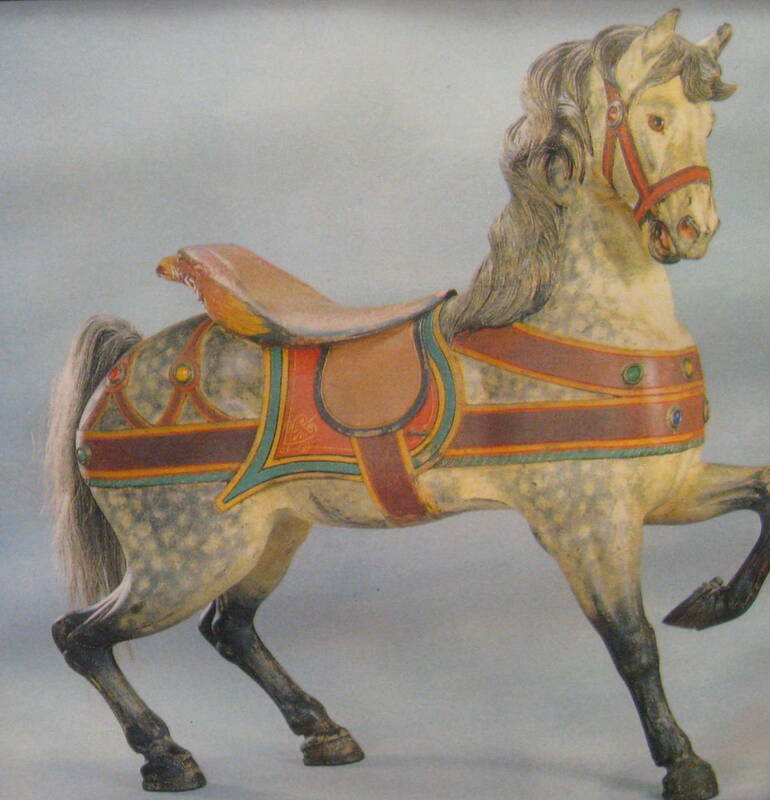 Carousels from then on had a horse called “Lillie Belle” on every machine produced. Lillie Belle had a bowed head and wild mane with 3 tendrils of mane pulled across her neck on the larger machines. Lillie Belle also had a bunch of grapes on the hip, and originally a lily and a bell behind the saddle. C.W. Parker carvings behind the cantle (back of the saddle) are some of the more interesting found on any carousel horses. His standard cantle carvings were hound’s heads, roses, tobacco leaves, bull horns, fish, shields, and ears of corn (from his Kansas heritage). His company sometimes carved strange creatures with gnome like features and large feet, and he went through a stage, in about 1906, where he carved dragons, fish, birds, and exotic women behind the cantles. But the ear of corn became his best known and most uniquely carved trademark. By 1925, the C.W. 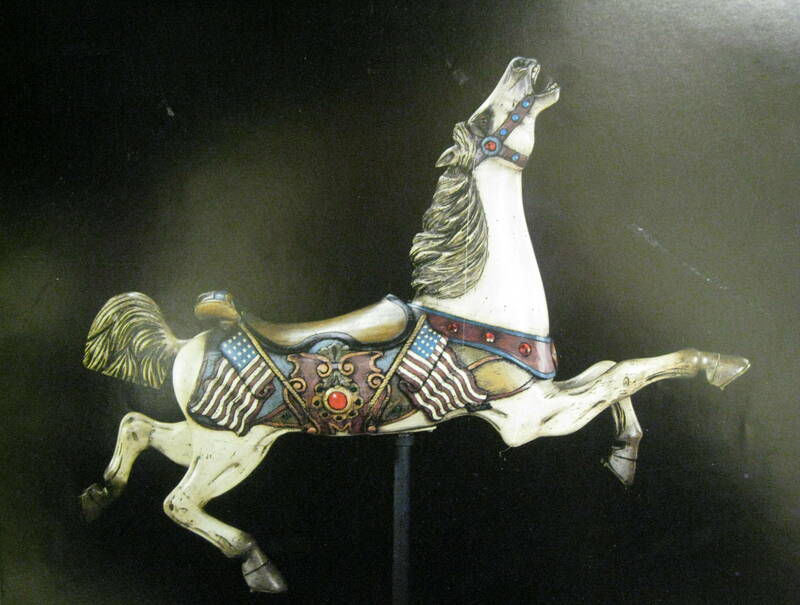 Parker factory began phasing out the wooden machine carved horses, and began creating the aluminum cast figures. Although they continued to refurbish some of their old machines with wooden horses, by 1930 Parker was casting all aluminum horses for his carousels. In 1931, C.W. Parker became ill, and his son Paul began to take over the operations of the Parker Empire. Of course, the worldwide Great Depression of the 1930’s caused a major pullback of those operations. C.W. Parker died in 1932, and was buried in the family plot in Abilene, Kansas. Although American born C.W. Parker never claimed to be a carver or an artist, he was a smart businessman who influenced the story of the Art of the American Carousel. 11. 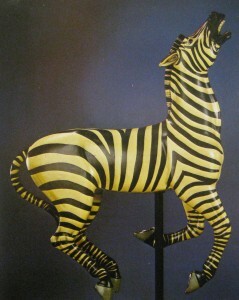 “Herschell-Spillman Zebra” 46” long, 54” high (c. 1912). 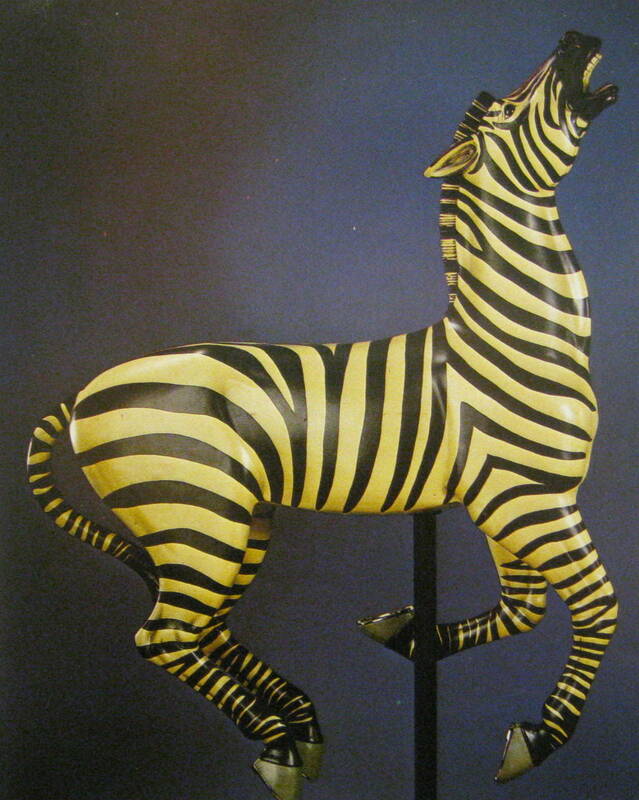 All of Herschell-Spillman’s zebras were carved without trappings, making them the only animals created that way by any of the major manufacturers. Not only are the stripes much more striking without interruptions, but also there is a sense of wildness about an animal with no man-made accessories. 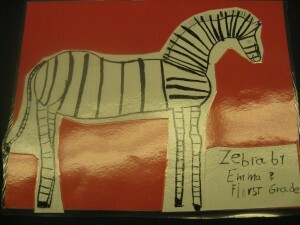 This zebra came from a class 1 carousel. Herschell-Spillman had 5 categories of Carousels to choose from, beginning with class 5, which was a two abreast carousel of simple horses, to the class 1, and an extra fancy machine with a full menagerie. 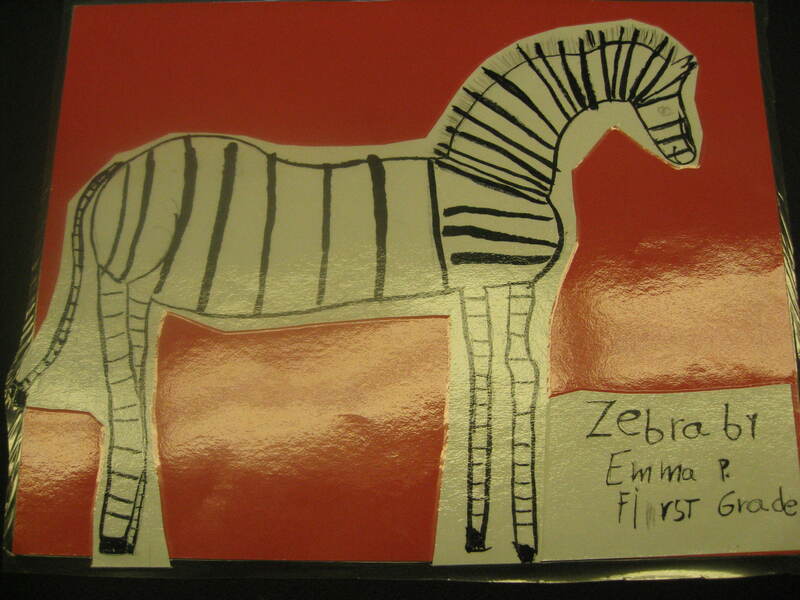 Many people think that zebras and horses look just alike except for the stripes. There are two somewhat obvious additional visual differences between horses and zebras. By looking at this picture, can you figure out what it is? A zebra’s mane does not grow as long as a horse and the tail is different. 12. “Herschell-Spillman Frog” 38” high, 42” long (c. 1915). 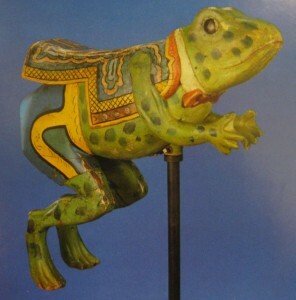 Not only is the Herschell-Spillman company the only carousel manufacturer to produce a frog, but the frog is the only American carousel animal known to be carved wearing human clothing. The inspiration for his outfit can probably be traced to Kenneth Graham’s 1908 classic, The Wind in the Willows. In this story, Mr. Toad wears similar attire before taking a drive in his motor car. There is a ride at Disneyland based on the same story, called Mr. Toad’s Wild Ride. The Herschell-Spillman menagerie carousel, at Oaks Park on the Willamette River, also has a frog like this. This park’s frog however, is covered with layers of park paint so it does not have the amount of artistic detail as the frog pictured here. This frog is painted in factory paint with his original metal vest buttons still attached. The opposite side of the vest has carved buttonholes. Notice the flying coattail saddle for riding. What is the difference between factory paint and park paint? All carousel manufacturers could repaint figures with factory paint. It was not always as beautiful as the original paint if the factory was not the same company who originally manufactured the figure. Each company had their own styles for painting. Park paint had no detail, shading or highlights because it was painted by an employee of the park or carnival who was paid little and usually not an artist. Why doesn’t the frog have metal buttonholes on BOTH sides of his vest? The more elaborate details were saved for the right side only, the ROMANCE SIDE. The inner side was painted only. 13. 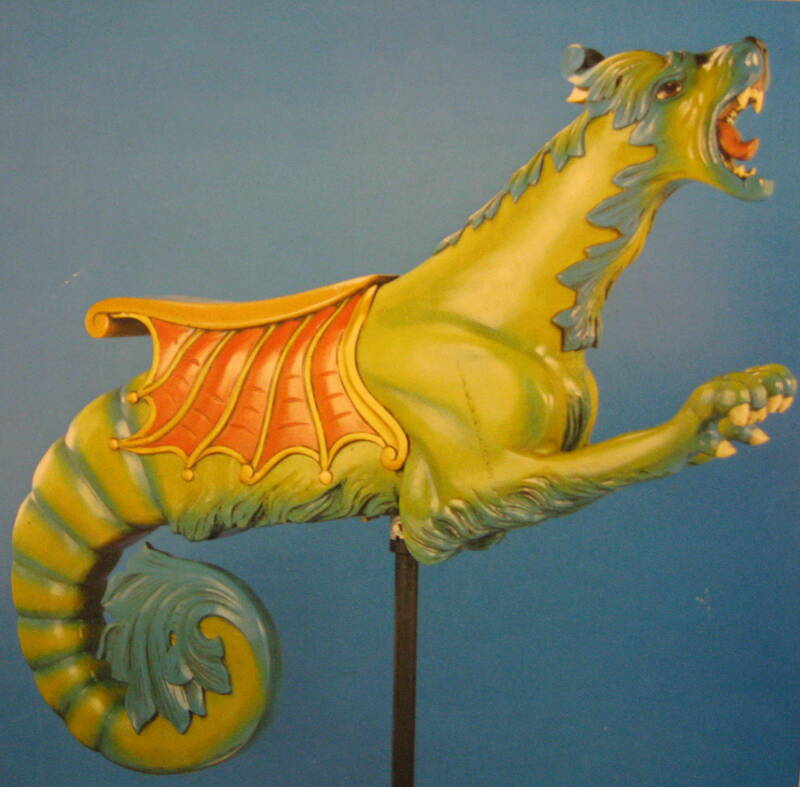 “Herschell-Spillman Sea Monster” 66” long, 60” high (c. 1912). Several companies created mythological creatures, but in America, they were always related to the sea. It is not known exactly where the inspiration originated, although tales of the Loch Ness Monster were popular in the very early 20th century. To emphasize the wild, exotic nature of these ferocious creatures, trappings were always kept to a minimum. The “Golden Age” of the American Carousel lasted for only 50 years, from 1880 – 1930. Of the approximately 3,000 to 9,000 complete classic wooden carousels originally carved in American factories (available records are lacking for an exact count), fewer than 200 are still in use today. Many have been restored but are hidden in private collections. Carefully carved and hand sculpted, carousel art has been a long neglected and misunderstood American art form that many still know nothing, or very little, about today. In Oregon and Washington, we are fortunate to still have several authentic classic wooden carousels. Portland’s Oaks Park still operates a classic (c. 1921) Herschell-Spillman Menagerie Carousel, which has a two-level platform. Menageries are carousels that have animals other than horses. These figures were completely covered by the flood of 1996. The carousel was quickly patched for public use but shows many signs of regular wear and tear in its multiple layers of “Park Paint”. Its kangaroo is a very rare carved figure. In downtown Long Beach, Washington, you can still find another Herschell-Spillman Carousel (c. 1928). The Jantzen Beach Carousel is an authentic C. W. Parker creation, the only one of four rare types built that is still in operation or existence. This carousel unfortunately lost its antique Band Organ after its renovation in the 1990’s. (They still have recorded music but most of the time this is not even used these days.) Enchanted Village, in Federal Way, Washington, has a smaller, classic Parker carousel (c. 1906). The Western Washington Fair, in Puyallup, Washington, maintains a Pennsylvania Toboggan Company Country Fair Style machine. This type of carousel was compact, with more simplistically designed carved figures, for easier transfer with traveling carnivals or small country fairs. Riverfront Park, in Spokane, Washington, hosts a premier Charles Looff machine (c. 1909). This machine is more than worthy of a special trip to Spokane to view it. It is a three-row machine, presenting a rare sneaky tiger and an early giraffe, has an Artisan Band Organ, and is complete with rare brass rings! Last but far from least, I feel a strong obligation to introduce you to the International Museum of Carousel Art (IMCA), once located in downtown Hood River, Oregon. This non-profit educational organization is dedicated to the preservation, restoration, and exhibition of the world’s remaining antique, wooden carousels. A chance summer visit to this unpretentious museum, in 2006, introduced me to the most uniquely American and extremely interesting art form, which I was formerly unable to understand, appreciate, or even actually see. Duane and Carol Perron, the passionate leaders of this wonderful organization, gave me a rare and unique opportunity to spend time at their home in Hood River, and to generously glean information from them. I was also allowed to photograph one of the most amazing and comprehensive collections of carousel animals and rare carousel art to be found in the world. The Perron Family has built a collection of hundreds of carved figures and more than a dozen complete carousels. Many figures have been beautifully refurbished, repaired to working condition, and placed in new locations for public use. The Perrons want to keep classic wooden carousels in the public realm for future generations. If you ask Carol Perron why Carousels have become her passionate life endeavor, she will tell you that it is because of the magic the carvers put into each individual carousel animal. That magic is highly contagious and what inspired a need in me to create this Packet. “Dentzel Rounding Board with Shields” (c. 1890). 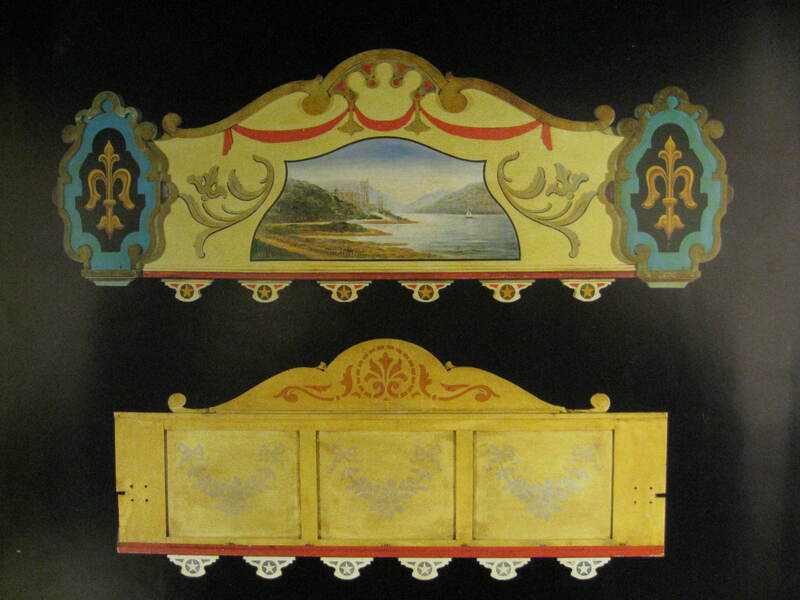 Rounding boards are the decorative coverings, painted with a variety of scenes, attached to the top of the carousel, which hide the mechanisms. Along with the shields, rounding boards form a decorative cornice around the top border of the carousel. Rounding boards are also often decorated with lighting and mirrors. American symbols were always popular decorations for the trim of American carousels. Dentzel and the Philadelphia Toboggan Company often painted cowboys, buffalo, and Indians of the western plains on their rounding boards. C. W. Parker painted rural scenes familiar to mid west Americans of the day. Restful storybook landscapes, circus, and jungle scenes were popular too. 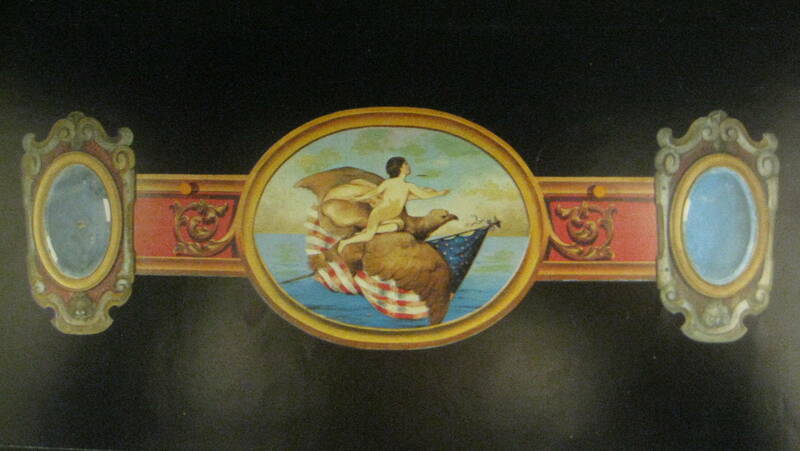 This rounding board, in original paint, has a painted illusion of a carved frame around the scene of an eagle that is clutching an American flag and carrying a symbol for purity. By painting shadows around the edge, the painter was able to save the carver a lot of time and materials because he didn’t need to carve an actual frame. The mirrors on each end are encased in a carved wooden frame. The mirrors are actually separate pieces called “shields”. Shields were used between the rounding boards, to hide the joints and create the look of a solid cornice all the way around the carousel. Shields could be oval, round, or even shaped like a medieval coat of arms. 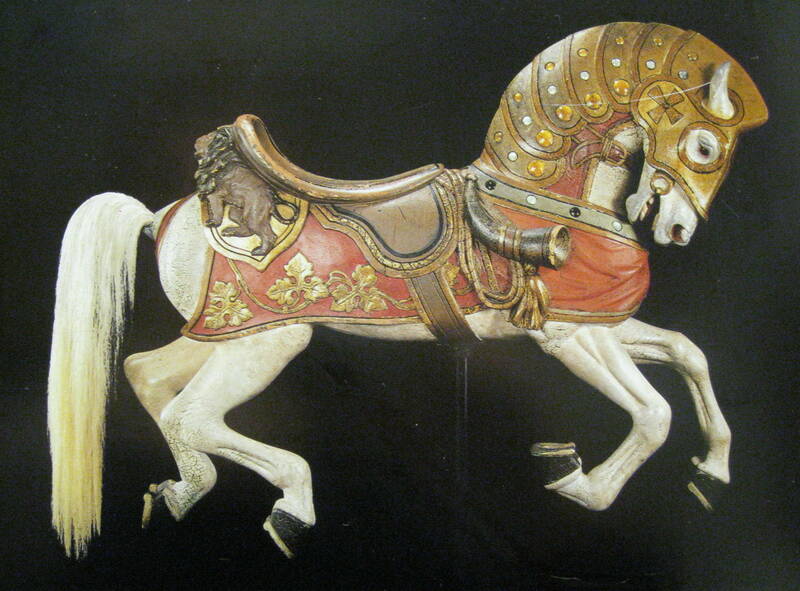 Carousel shields were created from wood, plaster, or a combination of both. They were often painted with decoration and sometimes they were decorated with carved frames and mirrors, as we see here. Patriotic Charles Looff produced several carousels with portraits of American presidents painted on the shields. Sometimes high relief jesters or clowns are found on shields. These were usually formed from plaster molds and painted. The carousel at Disneyland has painted high relief jester shields. The shields of the Jantzen Beach carousel are decorated with high relief cherubs (baby angels). This mostly yellow set of rounding boards shows an example of the front, as well as the backside. Since the backs of these rounding boards were visible from the platform, stencil patterns were used in order to give the entire piece a consistent image. Stenciling was a quick and easy way to paint an area that only the carousel riders might see. The Philadelphia Toboggan Company used stencils on most of the carousels they produced. Use scissors, stencils and/or stamps to create a decorative rounding board design on paper. 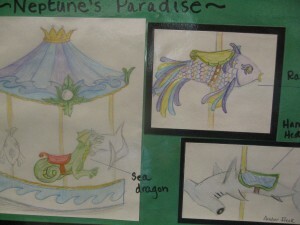 Draw a picture of a merry-go-round and create a detailed decoration across the upper rounding boards. The basic purpose of a carousel panel was to hide the interior machinery and the center pole. The earliest panels were only sheets of wood painted with a very basic pattern. As carousels grew fancier, the panels did too. Many displayed the fashions of the day; others explored the excitement of the jungle and the circus. Of course, the panels were also the perfect place to advertise the manufacturer of the wonderful machine the crowds stood admiring! Cut an interesting shape from paper to design a merry-go-round panel. First, fold the paper in half vertically to create a SYMMETRICAL shape for your panel. Draw a jungle scene, a fairytale landscape, or an advertisement for your own Carousel Company. Design artistic letters to create your name with more than one color. Notice the way Dentzel did not use the exact same style of writing on each line. These panels will look nice displayed together on a classroom bulletin board. Anyone who has ever ridden a carousel will say that the ride is not complete without the wondrous sound of a band organ playing a Strauss waltz or a Sousa march. Carousel rides without music are certainly incomplete. Actual 2 or 3 piece bands provided tunes for the earliest carousels. Carousel rides were a magical experience that lasted only three minutes. Music added to the excitement of the adventure and attracted paying customers from far away. The boisterous sound of a Band Organ, which cost between $2,000 and $3,000 in 1900, was an effective way to make the presence of a carousel known from far away. High quality carousel manufacturers used the finest quality organs imported from Italy, Belgium, and Germany. These wonderful instruments were enclosed inside elaborate wooden cases. Band Organs sometimes included animated human figures that could bow and turn to the beat of the music they played. Some of these carved figures included drummers with moving arms, a band leader waving a baton, or faces with mouths that opened and closed in time to the music. Wurlitzer was the leader in the band organ field. They manufactured an array of organs with as few as forty pipes to as many as two hundred fifty pipes and horns. The organ seen here was one of the most popular on working carousels. It is much larger than it appears here. Band organs were housed near the center pole of the machine. Most of the working part of the organ was hidden behind the decorated center panels. “Dentzel Dappled Stander Gustav Dentzel” 65” long, 58” high. Circa 1895. In 1860, Gustav A. Dentzel immigrated to Philadelphia, Pennsylvania from Germany. Twenty-year-old Dentzel had been carving carousel horses with his father since he was a young boy growing up in Germany. The young woodworker opened a cabinet making shop in Philadelphia. A short seven years after arriving in America, Gustav changed the name of his cabinet shop to “G. A. Dentzel, Steam and Horsepower Carousel Builder”. It was then that Gustav Dentzel’s lifelong dedication to the art of carousels officially began. Before Gustav started his American carousel manufacturing business, he did his research. The resourceful woodworker toured American cities and towns with a small, portable carousel, which he had carved himself. His research proved that American people were willing to pay for the chance to ride his galloping wooden horses! Gustav Dentzel was the talented artist who has come to be known today as “The father of the American Carousel”. At first, Gustav used horses to move his carousels and then switched over to the more modern steam engine for power. Electricity was not yet used to power these machines in Gustav’s lifetime. This American carousel pioneer died in 1909, but his son, William Dentzel, successfully ran the family business for another twenty years. Who do you think carousels were originally invented to entertain—adults or children? I bet you will be surprised to know that adults were the first ones to form long lines to ride the new carousel inventions. The animals on the earliest carousels were attached solidly to the platform, with three or all four legs. These figures could not move up and down as they circled on the platform. This style of stationary carousel animal is called a Stander, the original style of carousel figure. A few very early American carousels had animals that would swing, but these were just suspended by chains or bars from beams overhead. 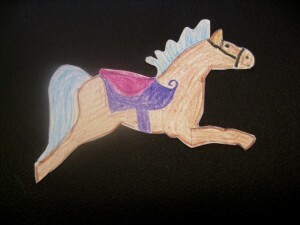 Some companies referred to this first moving type of figure as a “flying horse,” a “flying Jenny,” or “Spinning Jenny”. In about 1880, an Englishman named Frederick Savage invented the jumping, or galloping mechanism. Suddenly carousel rides became more exciting and more like riding a real horse! Savage was also the inventor of the carousel steam engine, which replaced horse or human power, and was used to power carousels for many years. Gustav Dentzel placed standers on his outside row horses even after he began carving animals for the jumping mechanisms. His jumpers were kept off the outside row but given free rein in the inner circles. “Outside Row” horses were located on the outermost row of the carousel. These animals were the largest and had more elaborately carved trappings on their Romance Side, which was the side that that faced the spectators as they approached. This was purposely done to attract the attention of paying customers. On American carousels, the more decorative romance side was on the right of the animal. 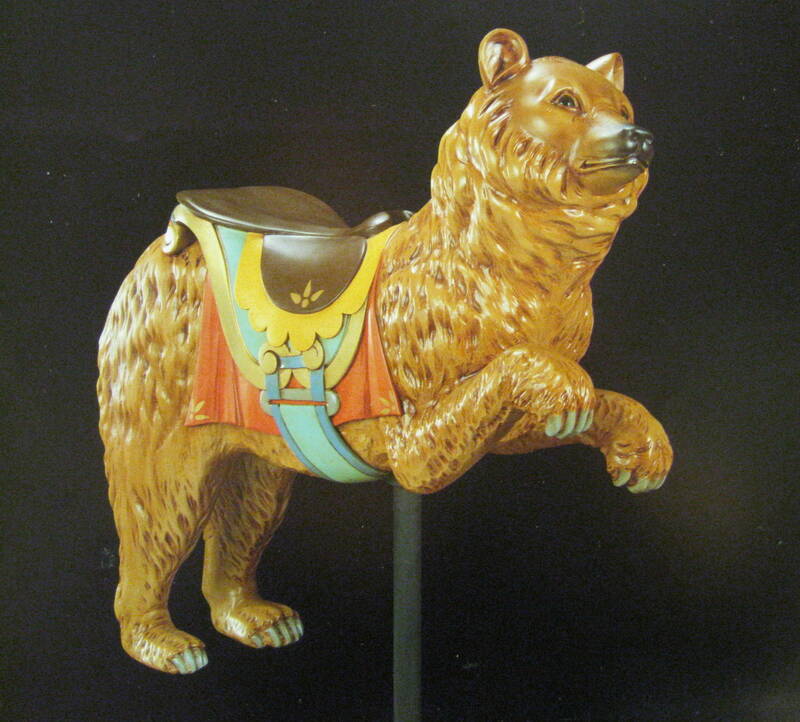 The inside of the carousel animal, the left side facing the center pole, had simpler decorative detail, which was often only painted instead of being carved. Dentzel, who did not often use glass jewels, attached colorful jewels on the Romance Side of this particular animal. The jewels pictured here are held on by metal frames, which are tacked on to the horse with small nails. On the opposite side of the horse, the jewels were only painted on. This stander has been painstakingly stripped down to the original paint. The horse was painted this way by the original carousel manufacturer. Carousel animals received a lot of wear and tear with so many people riding them everyday. Carousel owners needed to repair them often and upkeep their nice varnish to protect the wood beneath. Because they were made of wood and usually left outside, they to be protected with paint and varnish to keep them from decay. Most carousel owners did not have a true eye for art. Sometimes, when paint was worn or damaged, the owner would send an animal out for factory paint. Factory paint was costly but had a high quality look. Any carousel company could repaint a horse, so factory paint was not always reapplied in the same artistic style of the original paint. Other carousel operators, not wanting to take the time to remove an animal, simply covered the animals with solid color park paint. Park paint was only color and did not have the pattern, highlights, or shading the original artist used because employees who applied the paint were not artists. Park paint can still be found in many layers on some classic carousels. When carousels with park paint are refurbished, many delicately carved details are often discovered beneath the thick park paint. How would you describe the pattern or texture painted on the horse? It is called “dappled” and looks like little white spots on the horse’s gray coat. To create this effect, the artist did not stroke on the paint, but lightly dabbed it using very little paint. Notice how the artist used a darker color on the lower part of the horse’s legs. The overall theme for Dentzel figures was realism. 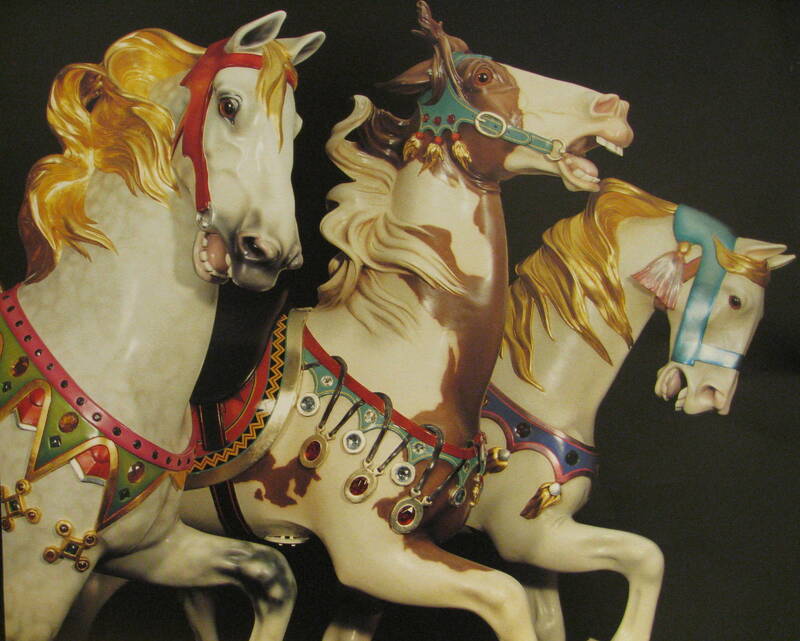 Original paint on the carousel figures usually followed the laws of nature, but the colors were not “subdued”. Many of the horses leaving the Dentzel shop were very painstakingly dappled and highly detailed. Notice the delicate LINE striping on the saddle blanket, which accented most Dentzel animals when they came out of the factory. What type of LINE do you see painted on this horse? All 5 basic line types—horizontal, vertical, diagonal, curved, and zig zag can be found on this horse. What did the artist do to create a feeling of MOVEMENT? The mane and forelock of the horse are carved with raised and curving lines, as if blowing in the wind. He felt these helped to create an illusion of realism as the breeze of the spinning carousel caused them to move. The left leg of the horse is lifted in a natural pose. Gustav also attached real horsetails to his carvings. As the figures moved around on the platform, the breeze this created would cause the natural tails to blow in the wind, like a real horse. A cantle is the back part of a horse’s saddle. What do you notice about the cantle of this horse’s saddle? The back of this saddle is carved and painted like a bird. In 1903, a striking change took place in the Dentzel factory carvings. Salvatore Cernigliaro, a cabinetmaker from Italy, immigrated to America and was hired by the Dentzel factory. Salvatore, or “Cherni”, first came to America in October of 1902. He was just 23, all alone, and poor. In Italy, he had carved furniture. Cherni adapted his skill for woodcarving to create carousel figures when he found his first job in America at a carousel factory. He caught on to the new type of carving quickly and liked it very much, but after only three months, this first job ended. Now unemployed, Cherni was given directions to Gustav Dentzel’s shop and went there to ask about work. When he entered the yard, Gustav stopped him. At that time, Cherni could only speak three English words—me, woodcarver, job? After Gustav realized Cherni was an immigrant, the normally stern and gruff toned man tried to speak to him in his own native German. The young foreigner understood only Italian. Cherni misunderstood Mr. Dentzel’s brusque tone, thought there was no job available, and walked away. After another week, Cherni was still unemployed and had only $4.00 left in his pocket. This was enough money to pay for one more night’s lodging. To get extra assistance in his job search that day, he entered a church that happened to be only a block from Dentzel’s shop. Inside the church, the woodcarver knelt respectfully to pray for help finding work. It was a hot day and he was thirsty, so after he finished, Cherni needed a drink of water. The woodcarver realized that he was close to Dentzel’s shop and remembered that there was a well in the yard. Mr. Dentzel recognized Cherni as he approached the well and again tried to speak with him in German. Again, the woodcarver repeated the only three English words he knew—me, woodcarver, job? Mr. Dentzel was a good man and felt bad for the young immigrant who obviously was still unemployed. He motioned for Cherni to follow him. Inside his shop there was another woodcarver, named Mr. Boory, who spoke a few Italian words. This woodcarver told Cherni that Mr. Dentzel had already hired him the week before but he had not shown up for work the next day. The young man told Mr. Boory that he had misunderstood what Mr. Dentzel had been trying to say to him. He thought there had been no work available. Mr. Boory told Cherni to go get his tools and start work immediately. The young and humble Italian immigrant left the shop and first went straight back to the church, to say his grateful prayer of thanks! 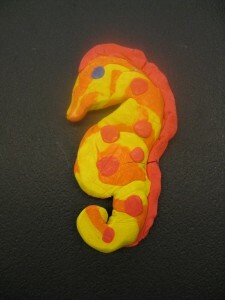 Cherni was talented and creative and soon earned a position as one of Dentzel’s Master Carvers. He brought new creative ideas and elegance to the look of Dentzel figures. “Parker Armored Horse” C. W. Parker Company (c. 1918). Armored horses were typically the Lead figure on carousels. 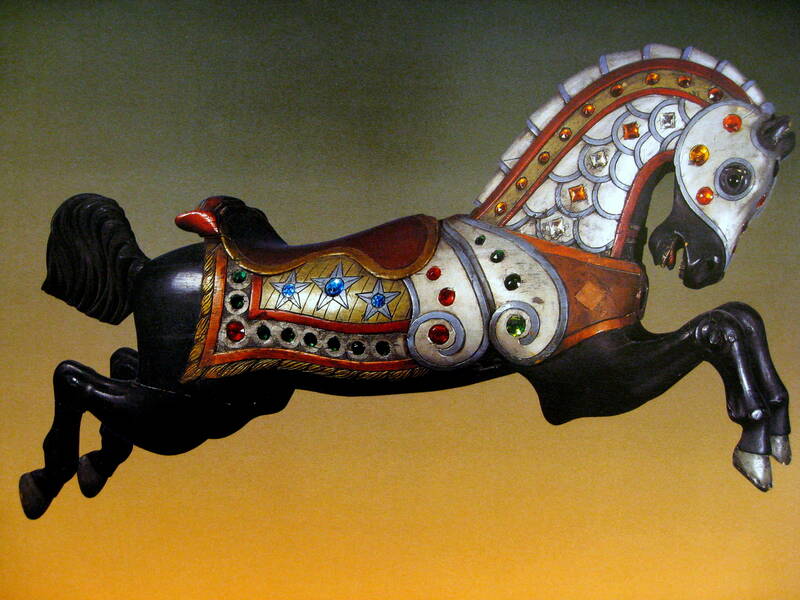 This horse was carved in the Leavenworth, Kansas shop of Charles W. Parker. If you go to see the Jantzen Beach Parker Carousel, you will notice more than one armored horse. An armored horse, however, is not the Lead Horse on this particular carousel. After it was refurbished in the 1990’s, the Lead Horse for the Jantzen Beach carousel was renamed in honor of an important Oregon landmark. The Lead horse on the Jantzen carousel is one of the most prized of all Parker style horses. It is carved in a dramatic Parker style called “Lillie Belle”. If you have the chance to visit to ride the Jantzen carousel, look for a black horse that stands out from the others. To be sure it is the “Lead Horse” you can look for a metal plaque, near the platform at the base of the horse, and it will tell you that the horse is indeed, the Lead one, and also the horse’s new name. “Portland” was the new name given to the “Lillie Belle” Lead horse, when it was dedicated on August 15, 1995. There was hardly a carousel produced by Parker that did not have at least one horse decorated with the Stars and Stripes. This was a reflection not only of Parker’s strong love of country but of his moral and political convictions, which were echoed in his company motto: Honesty, Cleanliness, and Morality. This horse was from one of Parker’s four rare permanent location carousels. It last ran on the carousel platform at Happy Camp, in California. Parker specialized in small, easy to transport Country Fair Style carousels. He built only four deluxe, permanent location carousels. The carousel at Jantzen beach is the last of these four rare Parker carousels still running. Permanent location machines were larger than Parker’s regular carousels. Because of this, the horses carved for these machines were also larger, just like this one. Parker exclusively produced horses and NO MENAGERIE ANIMALS.